Did you know that Lion Brand Yarn has a weekly newsletter? They do! You can subscribe to it so the newsletter will be sent directly to your email address. 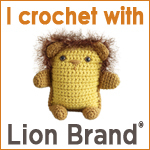 If you are a crochet, knitting or craft enthusiast, you are going to love seeing all that Lion Brand has to offer on a weekly basis! 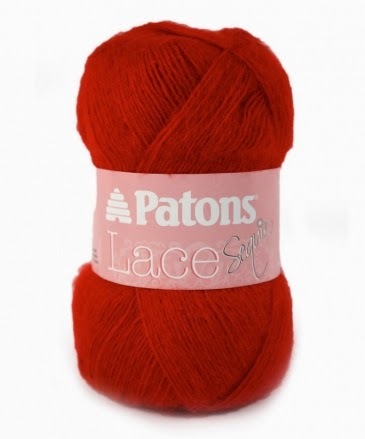 Patons has introduced a new yarn to their line and I cannot wait to try this yarn! The website describes it as a “lightweight cotton blend with a thick and thin texture”. I like to ‘dabble’ sometimes using different textures of yarns to see which crochet stitches make it look it’s ‘best’. The colors of Venus are super inspiring and I cannot wait to see them in person. I will definitely be checking my local crafts stores to see if they have this in stock. Has anyone seen this yarn in stores yet? Don’t miss out on Craftsy’s Mystery Markdown Flash Sale! Friday, May 17 at midnight PST 2014. I recently had the pleasure of designing a new scarf pattern for a family member. It needed to be a warm weather ‘fashion’ scarf and unlike more of my cold weather accessories, I wanted it to be ‘dainty’. After browsing the yarn section, I decided to choose a yarn that I have not worked with before, Paton’s Lace Sequin in #37707 Ruby, since red is Mary Jo’s favorite color. Isn’t it a beautiful color of yarn? 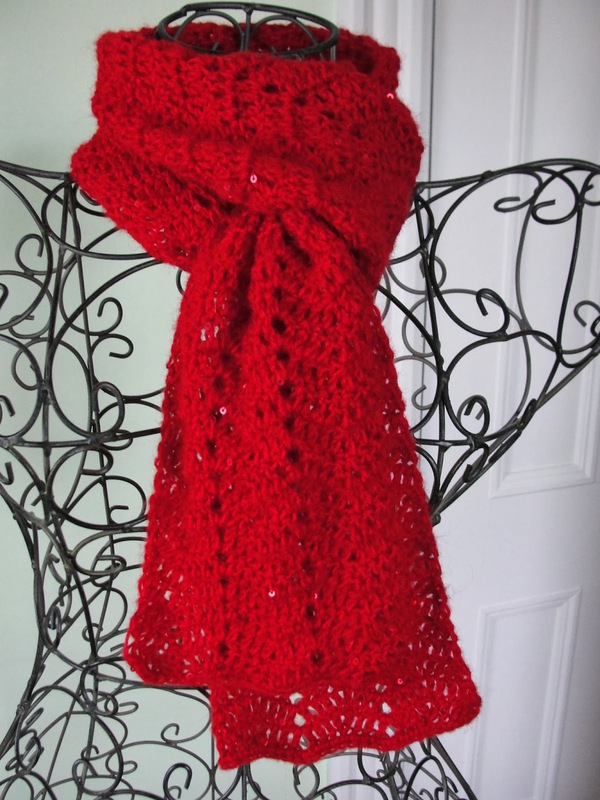 I loved the stitch definition and the drape that I achieved in this scarf. I used a G hook (4 mm), as I wanted the design to be a bit ‘lacey’ without the double crochets looking too ‘holey’. The 4mm hook worked well to achieve the look and drape I was going for. When crocheting with Lace Sequin yarn, you should try to be careful that you don’t need to rip out too many stitches (frogging). The yarn has a mohair quality to it and sometimes crochet stitches and the small sequins got ‘stuck’ while I was trying to frog a row. But other than that, I had no problems with crocheting with this yarn. I would recommend this yarn to anyone who want to make something pretty and lacey with just a bit of ‘bling’ to it! There are free patterns available on the Make It Coats website! Today is I ♥ Yarn Day! Here at CUTE CROCHET CHAT, I am offering a 50% PATTERN DISCOUNT in ALL of my ETSY shops for today only! Use the COUPON CODE – TODAY – when you checkout at any of MY Etsy shops listed below and receive 50% off your entire order! All of my sites are INSTANT DOWNLOAD so you receive your order immediately! This coupon expires at midnight ET tonight! Many, many yarn related crochet and knit sites are offering specials today ONLY, so don’t miss out! Scroll down to see just SOME of the specials that are going on Today Only. If you know of other specials that would be of interest to our readers or are running a special in your own shop, PLEASE FEEL FREE to LIST THEM with links IN THE COMMENTS BELOW! Thank you! 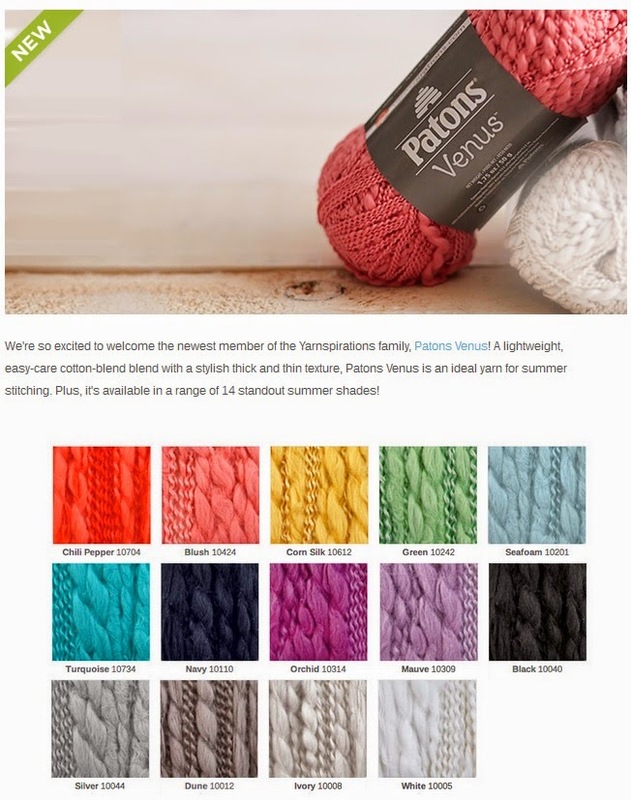 Yarnpirations is a brand new website which features yarns from Caron, Lily, Bernat and Patons all in one place! 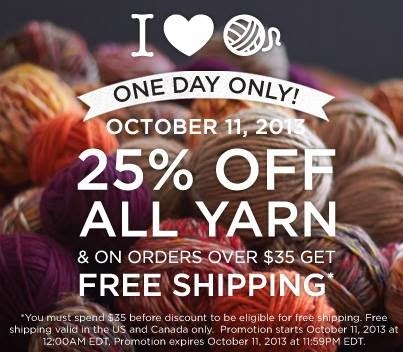 For today ONLY, they are offering 25% off all yarn and free shipping on orders over $35. 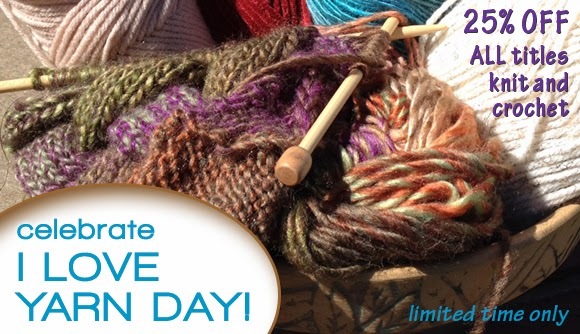 Vogue Knitting is celebrating I Love Yarn Day with a knitting and crochet pattern sale. All patterns are $2.99 today ONLY! Leisure Arts is celebrating ALL WEEKEND with 25% off ALL knit and crochet titles! 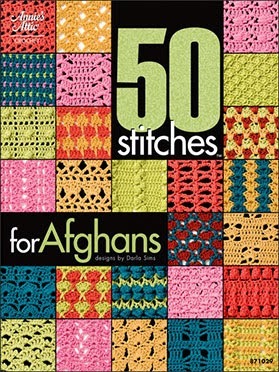 Annie’s Crafts is offering a FREE DOWNLOAD TODAY ONLY, of 50 Stitches for Afghans when you buy 3 or more skeins of yarn.